I went to my writer’s pitch conference with my new Hemingway-themed book and honestly, the reception was good. As is to be expected, suggestions were made but the feedback was positive. Two editors and an agent asked to see the first 50 pages. I’m in the process of doing final edits. My instincts were to send immediately before they forgot me. However, we were warned not to rush right out to send what we have before we know it’s as perfect as we can make it. Dealing with the business end of writing led me to think more about whether the Hemingway market was saturated. The Paris Wife came out in November 2012. Midnight In Paris, which had a prominent Hemingway character, came out in 2011. Mrs. Hemingway just came out in 2014. A movie about Hemingway and the captain of his boat The Pilar is due to come out next year. It’s called Hemingway and Fuentes and as I recall Andy Garcia is creating and funding the movie in part. A movie about Maxwell Perkins, (called Genius) Hemingway’s editor at Scriber’s, and his tempestuous relationship with Tom Wolfe (Michael Fassbender) is in the works with Colin Firth as Maxwell Perkins (this is to be released 2015). Although Hemingway and Fitzgerald, prominent Maxwell Perkins’ clients, are not the main focus, I’m sure that they will be mentioned honorably—or dishonorably—but they will be mentioned. another add-on to a market that was sick of hearing about Hemingway. It’s funny how you need to catch the wave. 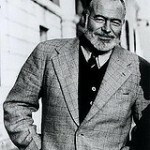 If no one is talking about Hemingway, then the concern is that no one is interested. If everyone is talking about him, the concern is that there is too much about it. You have to just hit that sweet spot between interest and not saturation. I had determined to write this book whether or not the market was saturated because I was fascinated by the concept and began writing it, and I finished. However, I have concluded albeit self-servingly, that the market is far from saturated particularly if you have a fresh angle. Hemingway as a personality—perhaps even more than as an author—intrigues. Whether it’s his drinking, his war exploits or inflated war exploits, his books, his women, his survival of two back-to-back plane crashes, his drunken rants, his dignity, his generosity, his self-destructive behavior—all of it resonates, at least in part, for everyone. So I’ll continue working on my book. I’ll post a first chapter on my personal website in the next several months: www.christinewhitehead.com. I will let all readers on this site know when I’ve done that. I’ve leapfrogged this book (The Hemingway book) over my second book because I feel it has more potential. But who knows? 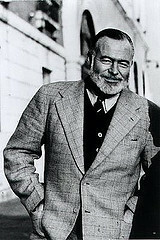 So, stay posted and I’ll let you know what happens with my Hemingway book as it journeys toward publication. Hope you are all having a wonderful fall. Here in New England it’s been cool—the summer was cool too—but very beautiful. This October in New England is almost heaven. Next Next post: What’s this Blog about? For those just joining in.